Jack Dempsey, the “Manassa Mauler”, reigned as heavyweight champion from 1919-1926. He made 5 successful title defenses. An explosive puncher in the early going Dempsey had 20 first round knockouts. His official record is 55-6-8 with 45 knockouts, although he may have had had many more bouts that are unrecorded. Joe Louis, the “Brown Bomber”, dominated as heavyweight champion for a record of nearly 12 years between the years 1937-1949. He made a record 25 successful title defenses, 21 of those by knockout and 5 in the first round. Of those 21 knockouts 17 were ten counts. At his retirement as champion his record was 58-1 with 49 knockouts, after an ill-advised comeback he finished with a total record of 66-3, 52 knockouts. A match up between two of the heavyweight divisions most powerful all time pound for pound hitters has been discussed for nearly 70 years by boxing fans, writers, and historians. Who would win if Jack Dempsey met Joe Louis with each at the peak of their powers? Looking at the above Tale of The Tape chart we can see that the two men are about equal from a standpoint of physical attributes. Louis is slightly taller; their reach is about equal. Dempsey's weight is that of the Firpo fight his highest and perhaps strongest weight, while Louis weight is that of his rematches with Buddy Baer and Abe Simon when at the peak of his punching prowess. Louis has a 15-pound advantage in weight and must be accorded a slight advantage in size. When fighters of near equal physical ability meet in the ring it is often the styles of the combatants that determine the outcome of a boxing match. From a styles perspective Jack Dempsey vs. Joe Louis makes for a fascinating study. Clearly many consider Jack Dempsey and Joe Louis as two of the greatest, if not the greatest heavyweights in history. Certainly they are considered two of the greatest pound for pound punchers in boxing history even up to this day, and many historians continue to rate Joe Louis as the greatest puncher ever. Respected historian Mike Silver rated Joe Louis #1 among "The 10 Greatest Punchers of All Time" in The Ring 1998 Boxing Almanac. Louis was also rated the # 1 puncher of all time in the article "The 100 Greatest Punchers of All Time" in the Ring Almanac 2004. Joe Louis is generally regarded as the better boxer of the two, and the sharper more accurate puncher. This, however, does not guarantee Joe Louis a victory. Igoe is of the opinion that Jack Dempsey would "have nailed him (Louis) with a left hook and finished him in the first round." In his Ring Magazine May 1936 piece Dempsey or Louis? Igoe explains why he would favor Dempsey. "The Toledo Dempsey would have swept away any living man out of his path and the slow starting Louis would never have got started against Jack. He would have been belted so hard and so fast that he would have gone down early. A counter puncher never had a chance against Dempsey of that day, when big Jess Willard was knocked upside down seven times in the first round." Is Igoe's opinion to be believed? He also claimed that the Toledo Dempsey would have knocked out Gene Tunney in the first round. Certainly not all observers feel the same way. Igoe was quick to criticize Louis at every turn in his Ring Magazine article, while not pointing out any faults in Dempsey. It is true that swarmers usually have a slight edge over counter-punchers because they force them to get off their shots before they have a chance to get set and put everything into their punches. An example of this is the Joe Frazier-Jerry Quarry bouts. Quarry had to fight Frazier off and it took something out of his punches. However, Frazier was stronger than Quarry. Dempsey and Louis are closer in strength and the weight advantage belongs to Louis. When forced to fight at a quick pace Louis was certainly capable of doing so. Ring Magazine founder Nat Fleischer wrote, April 1939 Ring, Louis Stands By Himself, "The Joe Louis who whipped Max Schmeling was great, but the Bomber that halted the progress of his pal John Henry was the greatest fighting machine I have seen in years. He was at the peak of perfection. Until the contest with Lewis I was of the opinion that in a fight between Jack Dempsey and Joe, the Manassa Mauler would have emerged the victor, but the Bomber who fought John Henry would have a better than even chance to knock out the Dempsey who stowed away Jess Willard. Louis has improved a hundredfold since he won the title. He has become a willing fighter. No longer does he wait to feel out an opponent. He sails in crashes his blows to the body and head, gives the opposition little chance to get set for a counter attack and wards off blows with the cleverness of Jack Johnson. Only Jack Johnson and Jack Dempsey of the fighters of the last 40 years compare to the Joe Louis of today in all around ability." Could Joe Louis hold off Dempsey’s first round blitz? This is the key to the entire fight. In an article, Joe Louis Compared to the Titans of the Past in the Oct 1938 Ring Magazine, several experts who saw them both fight gave their thoughts on a potential match. Joe Woodman, manager of Sam Langford for 19 years, is in agreement with Hype Igoe. "Dempsey's weave would have befuddled Louis completely, and Jack would have won easily. The Dempsey of Toledo would have beaten Louis or any other man that ever lived. He was a tiger that day. No one could have held him off." Izzy the Painter Faber, an old-time boxing instructor, seemed to support the opinion. “Joe would have beaten Dempsey. Rated off the Gibbons fight with Dempsey, I’m inclined to favor Louis, because I think he was a better puncher than Jack was.” Faber mentioning of the Gibbons fight is important, as we shall see after awhile. “Jack Dempsey was the better, stronger puncher on the attack, but Joe Louis could knock anybody’s brains out that he caught coming in” was the accurate summary of former heavyweight champion Jack Johnson. Because of the first Schmeling fight some observers are under the impression that Joe Louis was vulnerable to a straight right hand. Harry Wills does not buy that argument, saying, August 1, 1936 Chicago Defender, “Joe didn’t look like he was in the pink of condition in that fight. He didn’t look like he was positive in his punches. Joe showed me, both in training and fighting that he was capable of getting away from a right. He is no sucker for a right.” It is well known that Louis was over confident and under trained going into the first Schmeling fight. After he became champion “he improved a hundredfold” and became “as perfect a fighting machine” as ever seen, as noted by Fleischer. The question of durability is always a consideration when two punchers meet. Dempsey is considered to have the better whiskers. In a later opinion Dumb Dan Morgan picked Dempsey to beat Louis primarily for this reason saying, (McCallum p 47), "Joe Louis was a good fighter, sure, but I a saw too many second raters put him on the floor." This seems the primary reason Louis slipped from Nat Fleischer's ratings from a top 3 spot to about 6th by the time he published his all time ratings in 1958. As late as 1949 the Feb 19, NY Age reported that Fleischer rated Johnson and Louis numbers 1-2. Why Louis dropped in his ratings isn't completely clear but he no doubt felt pressure from the old-timers. If one looks at Fleischer's ratings 1) Jack Johnson 2) Jim Jeffries 3) Bob Fitzsimmons 4) Jack Dempsey 5) Jim Corbett 6) Joe Louis. One wonders exactly what happened to Louis after 1949 when he was an aging, declining fighter to deserve such a drop in his all time rating? The argument of having been knocked down by lesser fighters can be made against almost anyone. Besides the first Schmeling fight when he was a cocky 21-year old who thought he didn't need to train to win, and the post WW 2 version who was clearly not the Louis of his prime years, all of Louis knockdowns were of the "flash knockdown" variety. He was up quickly and in control of those fights before the rounds were over and was not close to being stopped in any of them. That shows he had strong powers of recuperation. Dempsey had a sturdy jaw, but he could be dropped too. He was floored 9 times by Johnny Sudenberg early in his career, although one can harldy hold that against a teenage Dempsey who was still learning the game. More importantly Dempsey was also down twice against the wild Firpo and almost out. He was also floored by Gene Tunney who was not known as a strong puncher. Muhammad Ali was nearly knocked out by Henry Cooper, he was also dumped by a much lesser fighter in Sonny Banks. Joe Frazier was dropped by Mike Bruce, and almost knocked out by Oscar Bonavena and according to his autobiography it was "not what you call a flash knockdown" as he was seriously hurt. Larry Holmes was dropped by 3rd rater Kevin Isaac, a hard hitting Earnie Shavers, and also Renaldo Snipes who was not known as a big puncher. These were also more than flash knockdowns. The fact is Louis chin is not nearly what it has been made out to be by overzealous critics. Louis took some terrific punches from Max Baer, regarded as one of the best all time right hand heavyweight punchers and they didn't make a dent in Joe. While not in the company of Jeffries, Ali, Evander Holyfield and perhaps Dempsey, Louis chin was still solid. Remember, when he retired as champion he had been knocked out only once in 59 fights and that before he reached his peak as a fighter. The outcome of this fight would likely come down to “who gets there first with the most.” Louis had a pair of the fastest hands in heavyweight history and the edge in hand speed goes to Louis and punching accuracy goes to Joe by a wide margin, as Forbes noted he was a great "sharp-shooter." Dempsey often coming in with his hands down low would be an inviting target for Louis quick and accurate punches. The Brown Bomber would be the one to land first with the heavy guns. As hard as Louis hit this would be the deciding factor, particularly since Louis really did throw perfect straight textbook punches. Former Jack Dempsey trainer Teddy Hayes describes how a Dempsey-Louis encounter would develop. Hayes was the trainer of Dempsey for eight years during the period when the Manassa Mauler pounded Fulton, Willard, Brennan, Carpentier, and Firpo. Hayes declared, Jan 18, 1936 New York Amsterdam News, "Why Kearns and I would never have thought of matching Dempsey with a boxer. We kept putting him in there with those big, slow bums and Dempsey made us all look good. We didn't want any part of that Tommy Gibbons fight, but gave Jack his way. And what happened? The first time Dempsey met a good boxer he was shown up. You know how Gibbons cuffed him around at Shelby: That was the tip-off on Dempsey." "Dempsey at his best wouldn't last four rounds with Joe Louis", insisted Hayes, "He'd let Dempsey force all the fighting and cut him to ribbons. He'd be stalking Dempsey from the opening bell, backing away, catching Dempsey's shots on his arms and elbows and waiting for the opening to put across that sleep producer." It has been claimed by several of the experts that Louis would have had trouble with Dempsey's weave or crouching tactics. Consider these opinions were given before Louis fights with Arturo Godoy, an iron chinned fighter who had only once visited the canvas in his previous 70 pro fights. 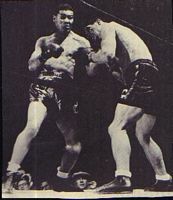 Godoy was a physically strong, bullish fighter who came in a low crouch to try and "befuddle" the champion. In the first fight he had some success, but in the second fight he was taken apart. The June 22, 1940 NY Sun reported after the second Godoy fight that "Louis education is complete with annihilation of Godoy." Louis put on a clinic in how to dismantle a crouching, weaving fighter. Joe demonstrated under-rated footwork in obtaining punching angles as he slid left and countered with sizzling right hands, and slid to the right firing hammering hooks to the head and body, and he caught Godoy coming in with smashing uppercuts with both hands. Godoy was pounded to the floor 3 times by Louis precise counter-punches and combination punching. By the time of this fight Louis had learned the lessons necessary to defeat Jack Dempsey. Louis would use just enough strong left jabs to pepper Dempsey and keep him at bay. For a fight where he respected his opponent’s ability, as in the second Schmeling fight, Louis did not drop his left hand one time and fought a perfect fight keeping his hands high, his elbows in and his chin down, he also used head movement to avoid wild shots. As Dempsey bored in Louis would slide to the side and catch Dempsey with his short, accurate and powerful counterpunches as he did in the second Godoy fight. The Louis of this fight knew how to create punching room and get the proper angles on a crouching, weaving fighter. Louis would survive the first round with superior boxing skills just as Tommy Gibbons had. Louis would then take Dempsey apart and eventually knock him out around the 8th round, a few rounds longer perhaps than that envisioned by Dempsey’s trainer Teddy Hayes. The final blow would be just as classic and picturesque as Louis knockout over James Braddock. Chicago Defender Aug 1, 1936. Harry Wills Gives a New Impression of Joe Louis. By Robert McKinney. McCallum, John D. 1975. Encyclopedia of World Boxing Champions. Chilton Book Co. Radnor, Pa.
NY Age. Feb. 19, 1949. Johnson or Louis? Nat Rated Them 1-2. By Ted Carroll. NY Amsterdam News Jan 18, 1936. Dempsey Not in Class of Joe Louis. NY Sun. June 22, 1940. Louis Education Completed. By Wilbur Wood. Pittsburgh Courier. Sep 21, 1940. Scribes and Fans A-Plenty Disagree with Igoe's Rating of Dempsey over Louis. Ring Magazine May 1936. Dempsey or Louis? By Hype Igoe. Ring Magazine Oct 1938. Joe Louis Compared to the Titans of the Past. By Ted Carroll. Ring Magazine April 1939. Louis Stands by Himself. By Nat Fleischer.